What do parents need to know about serving size and portion size? The serving size on a Nutrition Facts label is a specific measured amount. Calories and nutrient information is based on the serving size and a 2,000 calorie diet. A portion is the amount of food you choose to serve your children at each snack or meal. Parents need to be aware that a serving size on a Nutrition Facts label may not be the right portion for their child. For example, 15 crackers may be the serving size listed on a label; however, the number of crackers you serve your child will vary based on different calorie needs. 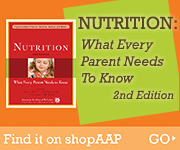 Parents also need to be aware that servings at restaurants can vary. For example, kid-sized hamburgers and kid-sized drinks can vary in ounces, and small fries at one restaurant could be the same size as medium fries at another restaurant. Parents should feel free to ask about servings sizes and if nutritional information is available. What are suggested portion sizes for children aged 1 to 10? The following are suggested portion sizes by age. However, your child's stage of growth and development, age, appetite, and activity will all play a part in deciding on what portion sizes are right for your child. In general, portions should be "child-sized" until adolescence.